Bonhams are advertising their next auction of Modern British and Irish Art with a painting by Walter Richard Sickert (1860-1942) of a woman in profile. It reminded me of an exhibition of Sickert paintings I went to see back in 2004 at Abbot Hall Art Gallery in Kendal. It was amazing to see them up close and personal. I was particularly struck by his use of muted dark colours with occasional bursts of intense light. I doubt I will ever approach him in his sophisticated use of colour but... yes but ... I'm going to have a go. 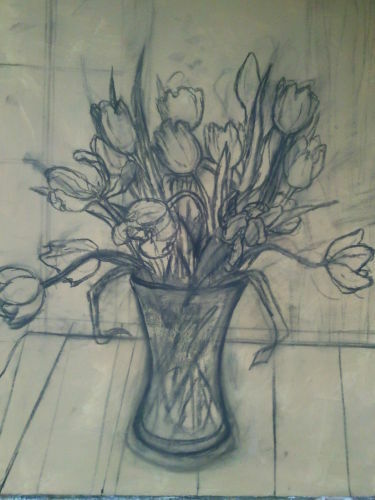 This is an underdrawing for my next painting 'Tulips', on canvas which has already had a coat of yellow ochre acrylic primer on it. The image is going to be 'contre-jour' which is a French artistic term meaning against the light. So the tulips will be painted in dark muted colours almost as a silhouette against the light coming from the window behind.This isn't how Walter Sickert would have painted them but it is a step in the that direction.